Hong Kong Air International Ltd was founded in the 1970s to provide helicopter services in the territory, such as scheduled flights, tourist flights, and external load lifting. The company was started by Maurice Holloway, as part of Hutchison (now Hutchison Whampoa), in 1971(?) and ceased trading in 1976. Many thanks to IDJ for sending the material used here and to Jon Mackay for typing out the original article which originally appeared in the UK magazine, Aviation News, around the mid-1970s. The images shown here accompanied the article. 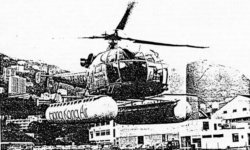 Although Hong Kong Air has only recently completed its first five years of operation, the company’s progress during that period has been quite remarkable, and its bright yellow helicopters have become a familiar sight throughout the many islands which make up Britain’s Crown Colony. 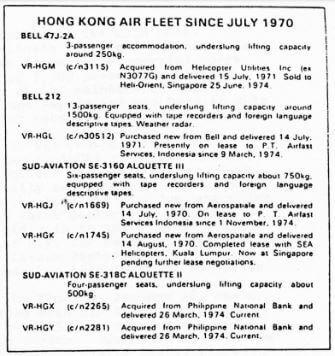 Hong Kong Air International Ltd, a part of the British-owned Hutchison international group of companies of which there are over 250 in Hong Kong and overseas, was formed on 16 January 1970. Operations started on 1 August with a fleet of two Alouette IIIs concentrating initially on tourist charters and other aerial activities such as survey and heavy lifting work. Due to the geographical and geophysical nature of the Crown colony (over two-thirds is rugged mountainous territory or shrubland, and totally unsuited to large-scale airport construction), helicopters were chosen as the most suitable equipment even though purchase and operating costs are relatively high. 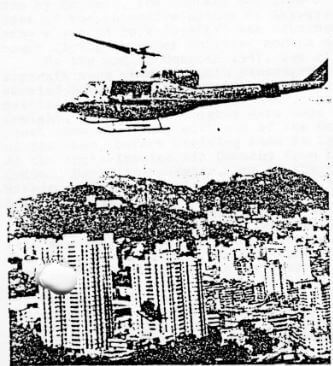 On 15 December 1970, Hong Kong air introduced scheduled passenger services between the Hong Kong Island heliport at Harcourt Road and Kai Tak International Airport on the mainland. Helicopters employed on this service ranged from the three-seater Bell 47J to the twin-jet Bell 212, capable of carrying 13 passengers. This fast four-minute service saved over one hour on the surface travel time between the two points and substantially reduced the check-in time for international flights out of Kai Tak. Up to 22 daily flights were provided in each direction, generally on a half hourly basis, leaving Harcourt Road at 0745 in the morning, the last flight arriving back at 2330 hours. Schedules were designed to connect with inbound and outbound international flights. The opening of the cross-harbour tunnel in 1973, in which the parent company has a considerable interest, resulted in the suspension of scheduled services on 31 December 1973. In just three years, Hong Kong Air carried a total of 96,808 passengers, no mean achievement considering the seating capacity of its helicopters. An application was made some time ago to the British Government for a scheduled service between Hong Kong and the Portuguese province of Macao, situated on the western shore of the Pearl River estuary some 40 miles from Hong Kong. As yet there is no indication that the service will receive approval. Bell 212 VR-HGL carrying drilling equipment to a building site in Hong Kong. This aircraft is now on lease to PT Airfast Services in Indonesia. Every Sunday and Public Holiday, flights were available until recently to Lantau, which is the colony’s largest island. These six-minute services between Harcourt Road and Silvermine Bay were non-scheduled, but operated approximately every 15 minutes during the morning and late afternoon. Hong Kong Air’s helicopters have also been successfully utilized on many other tasks including lifting items on heavy drilling equipment for the High Island Water Scheme, construction of overhead power lines in remote areas of the New Territories, construction of TV and telephone microwave towers, and the movement of building materials and spare parts to outlying areas. Its Bell 212 was used in the reconstruction of the Po Shan Road landslide area to airlift a consignment of eight tonnes of special measuring equipment. The landslide, which had claimed 83 lives, occurred in an intensively-built up district of Hong Kong, presenting added difficulties which the helicopter pilots successfully overcame. Apart from aerial lifting, Hong Kong air’s present fleet of Alouette helicopters is available for aerial photographic and survey missions, marine supply services to ships anywhere within Hong Kong Waters, cash and securities transportation and sightseeing tours to over 150 landing sites on Hong Kong Island, Kowloon, the New Territories and adjacent islands. The airline is also planning to expand into other areas in south-east Asia with a special interest in oil exploration and development work. This article was first posted on 14th June 2017.